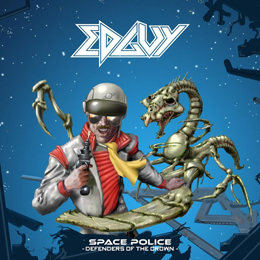 After more than two million discs sold with a usual entry in the Top-10 album charts and sold out headlining tours in 39 countries all over Europe, America, Asia and Australia, Germany‘s “most different“ are back with a vengeance with their tenth studio album “Space Police”. Opener “Sabre & Torch” with some nice guitar riffs and a Iron Maiden like voice sounds this track the max and I hope the rest will be the same, referring to their previous album “Rocket Ride”. Second on the album the title track “Space Police” is to flat with some fun riffing and some space keys, this one is to TOTO-like and not a power metal song. “Love Tyger” surprises me and I can’t hate this song, it is a fun song with a nice guitar riff in it. The I most like is “The Realm Of Baba Yaga” A really power metal song with a smooth guitar riff and great voice that blends perfect. Sixth number a cover from a German singer Falco “Rock Me Amadues”, not really a surplus to the version of Edguy. There are some good numbers on this album. First I thought I gone throw it in the trashbin but no I you like it just buy it.